Offering you a complete choice of products which include ceramic fiberglass cloth. Ceramic Fiberglass Cloth are manufactured from best quality Aluminosilicate (Ceramic) yarn. ceramic fiberglass based cloth is a soft resilient textile product which finds wide applications in various industries. It is available with the reinforcement of E-glass filament Metal wire as per client’s requirement.It is also available with High Temperature Laminate for superior performance. 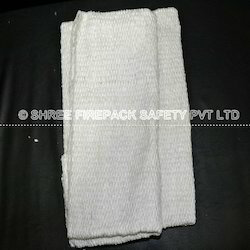 Applications: Suitable for application as fire-resistant curtains, protective clothing, controlled cooling of castings, insulation of gas steam turbines, welding curtains, cable fuel line protection, insulation linings, wrapping of exhausts, flange jointing with openings, radiant heat sheets, high temperature gaskets ec. Looking for Ceramic Fiberglass Cloth ?